Lake Sonoma 50 – My favorite race, my favorite course. I don’t know if that’s just because last year was arguably my best race ever, or if I just love the rolling California terrain. The course is gorgeous with emerald green hills, a turquoise lake, poppies, and wild iris. As a golden ticket race, it always brings out lots of stud runners, and because of the out-and-back nature of the course I get to spectate in the middle of the race. This year’s field was as strong as ever, especially on the women’s side. After finishing 9th last year I had hoped to have another top 10 finish but looking at the ultrasignup list going in I was ranked 40th! Top 20 would be a great day, maybe top 15 if things went as perfectly as last year. 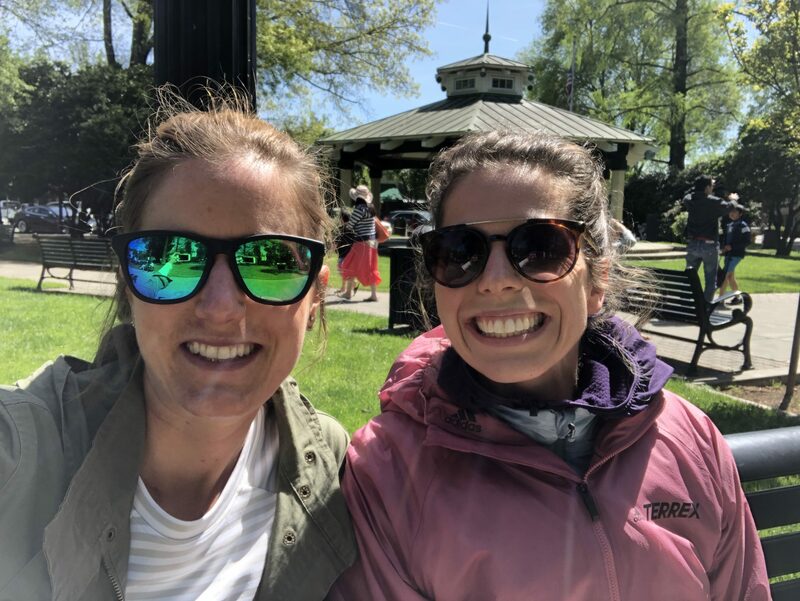 The race has such a great atmosphere and is just a really fun weekend of running, plus my friend Corrine was also racing and a weekend visiting her and planning for Western States was guaranteed to be a good time. I was definitely looking forward to this one – it was my “A” race for this spring. I have been battling a chronic hamstring/glute injury in both legs for years but it has been especially bad since November. Sometimes it is manageable, sometimes it isn’t. It wasn’t good at Black Canyons 60k or Chuckanut 50k. At Chuckanut I fought through it but compensations caused back spasms and a tweaked rib/facet joint that lingered all month. My co-workers tried to fix it a few times and I did what I could to loosen it up. Training between Chuckanut and Sonoma was hit or miss. I had some good workouts and long runs with Maria and some really bad days too. Race week wasn’t quite what I had hoped for. Starting the Friday before my legs just felt bad. My last long run on Saturday I felt super fatigued, tripped and lunged with my right leg which really irritated the hamstring tendon. I cried and thought about just going back to the car. But, I’m stubborn. So I finished the 14 miles anyway. In hindsight, I probably should have stopped that day. I think fighting through the run just left me tired and sore all week. My hami hurt, quads were tired, and my calves were trashed, plus my back felt even worse. Ugh. I tried to just trust things would improve before the race. Did lots of self care, extra rolling, extra snacking, extra sleep, and an extra rest day. The Wednesday workout didn’t go well either. I cried again. I just didn’t have any gears. When you have to work hard just to run slow, or slower than you were planning on, is not a good feeling. I was beginning to question if I should even do the race. Friday I did a shakeout with Corrine. 5 miles felt like a really long way. I limped at the start and it hurt the whole way. Going into Chuckanut my attitude and mental preparation weren’t good and I know that negatively effected the race so this time around I was trying to stay really calm and optimistic, hopeful that adrenaline would turn things around and that I could at least have some fun out there. I set A goals (top 10/PR), B goals (top 15/sub 9), C goals (top 20/ 9:24 which would be 1min/mile slower than last year), D goal (top 25/sub 9:34 -1hour slower), and as always the goal of just finishing. I also set goals of being positive and encouraging no matter what, having fun, and staying focused on loving the race no matter the result. I soaked in all the pre race excitement at bib pick up and the pre race dinner. Met lots of Corrine’s super fast friends. It was all great and I so so wanted to be lining up to RACE! To go for it, to hunt, to push myself to my limits without fear, without restrictions. Race morning logistics went smoothly and Corrine’s dad and brother would be at 1/2 way to crew for us. Jogging back and forth to warm up I wasn’t limping and felt better than I had all week. Maybe race day magic would happen! The race starts on a 2 mile stretch of road, which helps to thin the pack before hitting the single track. I started conservative and watched the leaders string out ahead. My legs felt surprisingly ok. Not good, definitely tired and I could feel my hami’s as soon as we started up the hill, but ok is better than I felt all week. After feeling downright terrible for days, ok was something I could work with. Last year I felt great through 30 miles, good through 40, and then struggled the last 10. I wondered to myself, “If I’m starting at ok where am I going to end up?” The first 18 of single track I rolled along, in and out of packs of guys. I knew I was slower than last year but felt the conservative pace was wise. My mantra became, “this is my all day pace, because I AM finishing!” It helped fight the urge to compete, the negativity that creeps in when you are knowingly off pace, and helped quiet the wondering when and if I should quit. Since my legs were the limiting factor, I could talk pretty easily. I chatted with some guys from Texas, tried to help a runner I thought might be bonking or dizzy because he kept tripping and nearly falling. Turns out he was legally blind; I kudos’d his bravery! The middle section opens up onto fire roads and has the three biggest climbs (with 10,500 ft the whole course is hills but there are 3 roughly 1000ft hills in the middle). I caught a pack of guys at the aid station and as we walked up the hill we made predictions on the race leaders and talked about the excitement of seeing the top runners coming back at us soon. One guy lamented, “Yeah, but they all look so fresh and fast!” I reminded him, “Yeah but when we hit the turn around and come back at the field – we are the ones who look fresh and fast in comparison.” It didn’t take long for the pro’s to start coming into view. First the men: Seb the Frenchmen charging hard, then Jared in pursuit with Walmsley anxiously waiting to crew, then Corrine’s teammate Tom who I enthusiastically cheered, then Kersh…I cheered for each and told them their place (maybe they already knew, maybe they didn’t care, but that’s what I want to know mid race so I hope it’s helpful). Some I expected to see were missing so I knew the warm temps and hard course had already caused a few DNF’s. The women weren’t far behind. Yiou looked super smooth and strong, Addie was less than 30 secs back, AnnaMae close behind…more studs, more cheers, extra enthusiasm for AnneMarie Madden and Corrine’s other teammate Abby, a high five from Magda (I told the guy next to me – “I’m never washing my hand”), then ALL the hollers for Corrine. The guy next to me questioned my enthusiasm and cat calls, I replied “That’s my girl!” and told him a bit about being teammates and getting to pace her at Western States. I think this was my fastest section of the race. It was by far the most fun. It also made me forget about dropping at 1/2 way. Corrine’s family helped with a smooth transition and I tried to take time to cool as I had felt really hot since around mile 10. The aid stations have limited water and ice so I didn’t do as good of a job as I should have and it definitely took a toll as the day progressed. Surprisingly my legs stayed at “ok” through 25 miles. I could move fine it was just like any gear over “easy” had been taken away. That turned into alternating bad and ok for most of the rest of the race. I ran all the downs and flat but had to walk most of the remaining ups as my hami’s threatened to lock up completely if I forced the issue. I focused on the good – my back surprisingly didn’t hurt, my calves weren’t cramping and tight like they had been all week, my quads felt great. So much to be thankful for! I stayed on fueling even when the heat made me nauseous. My normal routine of alternating Gu roctane summit tea and Spring gels worked like it has in every ultra all year. Early in the race a runner told me I was the quietest runner he had ever seen, like I was floating down the hill – so I tried to focus on efficiency and quiet feet to minimize quad pounding. I had listened to a podcast that talked about maintaining your “minimum moving pace” – basically making sure your slow isn’t super slow. I focused on hiking with purpose and quick transitions back to running when I could. I took in the scenery. I ran basically all 25 miles back alone. That’s a long way when you are really hot and tired. A few guys passed me, I caught a few others. Never saw any other women – they race too smart. I longed for the aid stations. To try to cool off, to see humans, hoping for motivation. I was walking up a climb when I saw the race photographer and he said “I know you want to run for this.” “Sure do,” I replied and ran by with an attempted smile. “Mid race photo shopping” I joked to him as we both knew that was not an accurate display of how my race was going that moment. Sure I was disappointed with my time and my place but my first thoughts were genuine gratitude and pride. I did something really hard that I really didn’t think I could do. Gutting out a 50k on a bad day is hard. Persevering for 9 hours and 41 mins takes a lot more grit and some humility to stick it out when it isn’t what you hoped for. I still love this race and I can’t wait to come back and really go for it again. I PR’d in midrace high fives and shared positivity and encouragement throughout the day. I’m proud to be a part of the amazing trail community even if I’m not as fast as I hope to be. 22nd female in a loaded field reminds me that I have potential if I can get healthy enough to train and race with less limitations again. It’s time to re-evaluate and figure out what it will take to be at 100% for next year. For now, I’m still having fun and doing what I love. I have raced 108 miles in the past 8 weeks. So thankful for that and coming away even more excited and passionate about this crazy sport.